It is called LPV: Love Promise Vow. This deck is for Valentine's Day. Marriage, what a romantic and luxurious word. "I do", the best answer in the world. The LPV decks are printed by The United States Playing Card Company. Printed at Q1 quality control on BEE Casino Stock, for unrivaled durability. 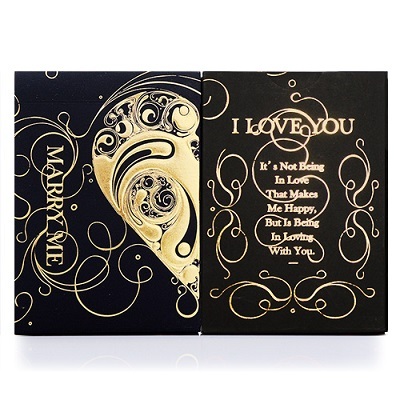 Luxury foil and meticulously embossed on a premium dark kraft box. NOTE: Getting both the decks you will have an absolutely fantastic set! The two tuck cases each have half a heart, one red and the other gold. Putting them side by side you will form a whole red and gold heart: that’s love! • Illustrated By Si Scott, one of the best artist in the UK. • Rider Back is a registered trademark of The United States Playing Card Company.